As of November 1. 2002 more than 530 DTV stations are on-the-air, roughly one in three commercial and educational analog TV stations in America. For at least the next four years, TV stations will operate their analog and digital transmitters simultaneously, creating a tremendous “traffic jam” on-the-air. Theoretical reception studies, making limited DTV reception predictions under ideal conditions, are available from antenna manufacturers and suppliers. Biro Engineering boasts same day computer-aided and developed DTV reception studies as well as professional on-site DTV signal surveys. There is a big difference between these two engineering services. The computer-aided DTV reception study is fast and inexpensive, but limited in information. On the other hand an expertly conducted on-site DTV survey can verify the presence or absence of interference, as well as signal levels not based on speculation but real values received by the test antenna. The DTV signal survey can also verify that several desired analog and digital stations can be received with the same antenna, reducing cost of the equipment and wind load on the tower. New DTV stations may generate excess noise in the pictures of currently carried analog programs. In turn, analog TV stations may produce co-channel or adjacent channel interference on HDTV channels. Subscribers, who spent $5,000 or more on new HDTV receivers can be very unhappy when those perfect pictures fill up with beats or become fuzzy. In certain metropolitan areas, like Washington/Baltimore or New York/Philadelphia, poorly assigned new DTV channels can create serious adjacent channel interference problems. Four case studies are presented below, illustrating the unmatched benefits of the On-Site DTV signal survey. During a Reading, Pa. Digital Signal Survey, the reception of Channel 44, a digital station from Camden, N.J., was disturbed by the analog Channel 44, Scranton, Pa. Observe the test results on the left side photograph. 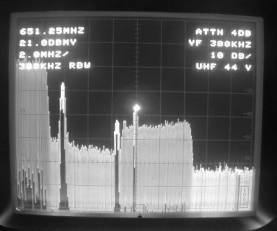 The undesired Channel 44 analog video carrier exceeded the amplitude of the DTV spectrum. Thanks to the cooperation of the DTV station, their transmission turned off for a minute, the Channel 44 video carrier was positively identified. (See the right-side photograph). 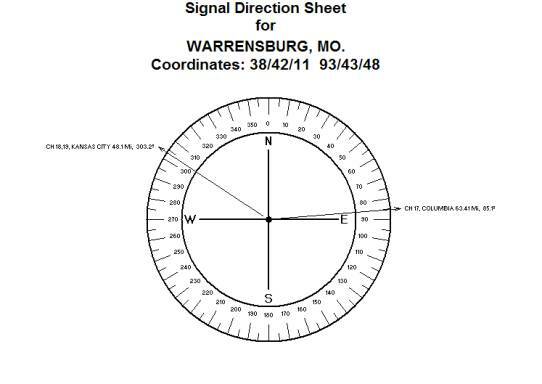 Exact Channel 44 directions and distances are displayed on the computer generated signal direction sheet below. 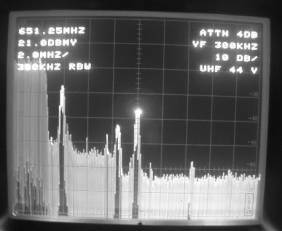 A quad-array of high-gain Channel 44 Yagis was recommended, with H = 33 ½” horizontal spacing, to force a deep radiation pattern null into the direction of the undesired carrier. OF A DISTANT DTV STATION. A DTV survey performed at the Trenton, N.J. head-end discovered that the reception of DTV Channel 44 is seriously affected by the adjacent local Channel 43 DTV transmitter. 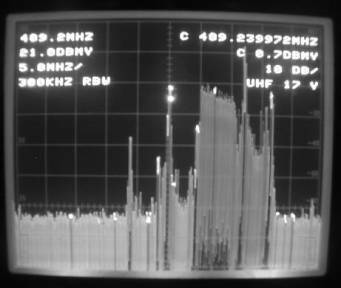 The photograph above shows that the undesired Channel 43 spectrum’s amplitude was found 20 dB higher than the desired Channel 44. 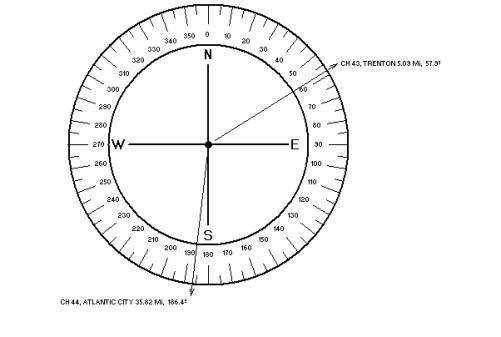 The computer developed signal direction sheet below confirmed the proximity of Channel 43, Trenton, displaying exact directions and distances. The carriage of Channel 44 was not recommended. No phased-array could guarantee a 35 dB reduction of the undesired carrier. In Warrensburg, Mo. the on-site DTV signal survey has proven that Channel 18, a DTV station from Kansas City, generated the excess noise observed on analog channels, Channel 17 and Channel 19. 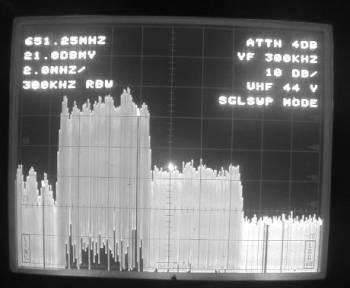 Observe the photograph below, the total Channel 18 spectrum matching the amplitude of the Channel 17 video carrier. 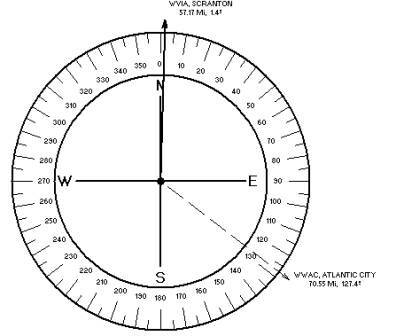 Exact, computer generated directions and distances on the signal direction sheet below indicated that the adjacent channel interference can be eliminated with a properly designed phased array. Originally, all eight (8) analog and DTV stations were to be received by a single eight-foot parabolic antenna. After developing the Signal Direction Sheet, the single receiving antenna concept was shelved. 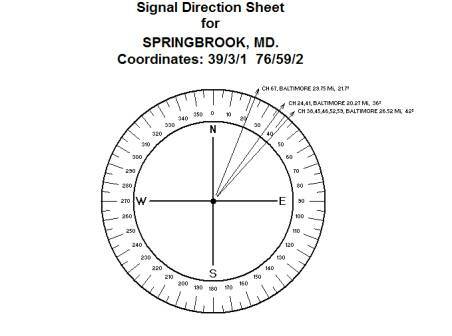 The Signal Direction Sheet below clearly shows that not all stations are received from the same direction. An 8’ diameter parabolic was designated to receive five (5) UHF stations. A 6’ diameter parabolic was designated to receive two (2) UHF stations. A 4’ diameter parabolic was designated to receive one (1) UHF station. 530 DTV stations broadcast HDTV pictures. In theory, we have a simple paradigm: they transmit, we receive them, end of story. Reality is never so simple. There are many pitfalls. An on-site DTV signal survey may prevent costly antenna tower relocations, stripping the tower and installing new antenna-arrays, as well as service outages. A professionally conducted DTV signal survey may become one of your best investments in the age of High Definition Television.